A fantastic bar hidden in the maze of streets in the Born. Like La Isla de Muerta it can only be found by those who knows where it is…. Although that’s clearly not true I can only find it by retracing the same route every time, if I try another way I always get lost! Renowned for their gin and tonics, I prefer the mojitos, especially the strawberry ones. Great value at €3.50 for a normal mojito, and €5 for a strawberry mojito – and according to my Cuban friend one of the best he’s ever tasted, so high praise indeed! They also have a selection of snacks on offer, simple stuff like hummus or spring rolls, the kind of thing it’s nice to nibble on after a drink or two. The owners are British, or English speaking at least, and owned bars all over the world before they gave it a go in Barcelona. Their experience shines in the delicious cocktails, awesome playlist (soul, indie, and 60s, 70s and 80s classics) and friendly service. 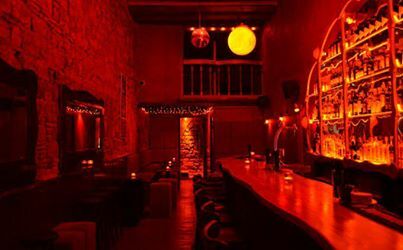 Ideal place for a hot date, dimly lit with red décor, and equally good for drinks with mates. Definitely worth checking out, as long as you find it, but worth the wandering if you do get lost. Be warned though, the mojitos are stronger than they taste and tend to sneak up on you! Cash only. Previous ArticleTrue integration into Catalan Society: an impossible dream? I can testify to the sneakingup on you! I should have taken your advice – three is doable, four is suicidal! Haha, I hate to say I told you so, but….. 😀 They’re just so tasty, that’s the problem!